Part 01: Background to P Company. Part 02: Entry Standards and Applications for P Company. Part 03: Preparation for P Company. Part 04: Outline of the All Arms Pre-Parachute Selection (AAPPS) course. Part 05: Basic Parachute Course. Part 06: Training Areas and Units. By the requirement of their role to operate with minimal or no support behind enemy lines and against numerically superior forces. The Para’s drop by parachute into battle and although they are lightly armed, they are incredibly proficient. They will move to quickly overcome enemy resistance at their objectives and ‘Hold until Relieved’. Although British Forces have not dropped into operations since the Suez Crisis in 1956, in January 2013 200 French paratroopers used this method of insertion to help retake control of Timbuktu airport during the conflict in Mali. UK troops continue to ensure they are ready for a similar tasking by conducting airborne exercises such as the 10-week Exercise Askari Storm conducted in 2013 by troops from the 3 Para battlegroup (Clapson, 2013). The Para’s, with one exception (Section 1.7), deliver Pre-Parachute Selection training to all UK military personnel through Pegasus Company; ubiquitously known as P Company (the term used throughout this article to avoid confusion). 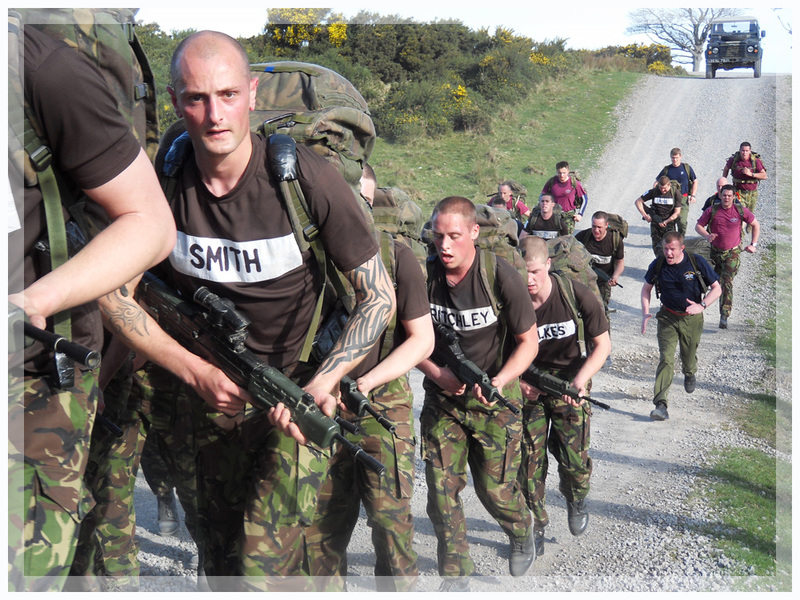 P Company is a notoriously gruelling course which is both physically and mentally demanding and includes a high-level assault course, the gruelling log race and a brutal form of boxing called “milling”. P Company is located at the Infantry Training Centre in Catterick, North Yorkshire, and is open to all Regular and Reserve personnel, both officers and other ranks, who aspire to serve with airborne forces. Only by passing P Company will individuals be awarded the coveted maroon beret and become part of the airborne brotherhood. However, individuals must then subsequently attend the Basic Parachute Course to earn their wings. Block 1: Strength, Conditioning and Familiarisation Course (2.5 weeks). Block 2: Physical and Mental Development Course (2.5-weeks). Block 3: P Company (Pre-Parachute Selection) Course (3.5-weeks). Stage 2: Basic Parachuting Course (2 to 3-weeks). This article is divided into seven sections for easier reading, starting with Section One which provides a brief history to airborne forces, aim of P Company and gender. Section Two looks at entry standards and applications before moving onto Section Three which provides an overview of the latest iteration of preparation packages available to airborne aspirants. Section Four provides an outline of the course proper (the information most people are after) which looks at the various tests that must be successfully completed during, as well as at the end of, the course. Section Five provides an outline of the Basic Parachute Course which is required to wear the distinctive Para wings. The penultimate section looks at the training and units encountered during P Company and finally Section Seven provides some useful information about P Company as well useful links to relevant websites. Video version can be found here. The maroon beret of the Para’s was first seen by German troops in North Africa and within months they had christened the ferocious Para’s as Rote Teufel or Red Devils. This distinctive head dress was officially introduced in 1942, at the direction of General Browning, and the Pegasus symbol (Section 1.2) became the emblem of British Airborne Forces. The maroon beret has since been adopted by parachute troops all over the world. In June 1940, with the UK facing invasion, Winston Churchill was calling for the formation of a number of special units to harass the enemy. As part of this call, Churchill expressed a wish for a Corps of at least 5,000 parachute troops who he stated should be suitably organised and equipped. It is from this date that British airborne forces start their history. Despite a lack of experience and equipment, a small band of resourceful men began at once to create this new force. As a result the Parachute Training School and Central Landing School were established at Ringway Airport, near Manchester. Personnel of No.2 Commando were selected for training, and the first jumps carried out on 13 July 1940. In September the first Hotspur gliders were ordered. By the end of 1940, No. 2 Commando, now 500 strong with a parachute and a glider wing, was renamed the 11th Special Air Service Battalion. In February 1941, only nine months after formation, the first airborne operation took place, when 38 men parachuted into Southern Italy to destroy the Tragino Aquaduct. After these tentative trials, 1941 was a year of development and expansion. The 1st Parachute Brigade was formed in September, and shortly afterwards, an infantry brigade became the 1st Airlanding Brigade, with four airlanding battalions and supporting arms and services, started training with the gliders now coming off the production line. In India the 50th Indian Parachute Brigade was formed. Major General Frederick Browning was appointed Commander Paratroops and Airborne Troops. From his small headquarters, the 1st Airborne Division was formed in November. In December, the Glider Pilot Regiment was established, as part of the Army Air Corps, to fly the gliders: initially Hotspurs and Wacos, then Horsas and Hamilcars. The officer and sergeant pilots, all trained soldiers, fought many gallant actions alongside the airborne troops they had landed. Later in August 1942, all parachute battalions became battalions of The Parachute Regiment in this new Corps. In February 1942, C Company 2nd Parachute Battalion, under Major John Frost, carried out the highly successful parachute raid to capture a vital part of a German radar installation at Bruneval in northern France. During the year, the 1st Airborne Division was built up, based on the two brigades. The newly formed 2nd Parachute Brigade, together with a full complement of supporting arms and services, trained to land by either parachute or glider. No. 38 Group RAF was created to provide transport and work closely with the division. In total the Para’s took part in six major parachute assault operations in North Africa, Italy, Greece, France, the Netherlands and Germany, often landing ahead of all other troops. The Para’s would eventually comprise 17 Battalions with the majority forming part of the 1st Airborne Division, the 6th Airborne Division and the 2nd Independent Parachute Brigade in Europe. Three battalions served with the British Indian Army in India and Burma. At the end of World War II, the Parachute Regiment was reduced to three Regular Army battalions, first assigned to the 16th Parachute Brigade and later the 5th Airborne Brigade. The reserve 16th Airborne Division was formed using the Regiment’s reserve battalions in the then Territorial Army (now Army Reserve). Defence cuts gradually reduced the reserve formations to a parachute brigade and then a single reserve battalion. During the 1960s Major General Glyn Gilbert was instrumental in ensuring the Parachute Regiment’s survival and in advancing the doctrine of airborne warfare. He also created the Red Devils parachute display team and instituted the Platoon Sergeants’ Battle Course, which was later extended across the British Army. 4th Battalion (Army Reserve): headquarters at Pudsey, West Yorkshire, with companies in Glasgow, Liverpool and London. The emblem of the airborne forces is Bellerophon mounted on the winged horse Pegasus. The first recorded instance of an airborne warrior, his exploits are recounted in Greek Mythology where he is chiefly famous for slaying the fire-breathing monster Chimaera. Mounted on Pegasus, with spear in hand, Bellerophon rode into the air, swooped down upon the monster and destroyed it. The emblem was chosen for the British Airborne Forces by the late Lieutenant General Sir Frederick (“Boy”) Browning GCVO, KBE, CB, DSO, DL, when he was appointed to raise Airborne Forces in 1941. The emblem was designed in May 1942 by Major Edward Seago, to be worn on the arms of all airborne personnel. The aim of P Company is to test physical fitness, determination and mental robustness, under conditions of stress, in order to determine whether an individual has the self discipline and motivation required for service with the airborne forces. In accordance with current Government policy on the employment of women in the UK military, service in the Infantry (i.e. Parachute Regiment) is only open to male volunteers. However, appointments do exist for women within the Army units that support 16 Air Assault Brigade and as such women can apply for P Company. On Monday 18 April 2005 the BBC News (2005a) reported that the 5ft 3in, 23 year old Lieutenant Jenny Hands, a Troop Commander with 13 Air Assault Regiment Royal Logistics Corps, was going to attempt P Company and potentially become the first woman to earn the coveted maroon beret. Unfortunately, on Friday 22 April 2005 the BBC News (2005b) reported that Lt hands had been withdrawn from P Company due to injury, having sustained a stress fracture to her right leg on day five of the course and therefore unable to continue; although the BBC headlined the story as “Broken leg ends woman’s Para bid”. News of Lt Hands attempt of, and subsequent withdrawal from, P Company provoked some lively (and frequently poisonous) discussions on the forum ARRSE (2005). On 09 March 2014 the Daily Mail (Chandler, 2014) reported that “women soldiers have had the green light to try out for the elite Parachute Regiment.”, which somewhat misrepresents what the Deputy Commander of 16 Air Assault Brigade, Colonel Andrew Jackson, is quoted as saying in the article. Elite Forces, like the Royal Marines and the Parachute Regiment, are characterised by the determination of the group to carry through with the mission as a group. This is in contrast to Special Forces who are characterised by the determination of each individual to carry through with the mission even if they be the last one standing. There is a presumption that personnel who volunteer for P Company will become, or develop into, very good team players. And, although there is an element of individual work required the emphasis is on team cohesion and teamwork. Stronger team members are expected to aid weaker team members through knowledge development, encouragement and camaraderie; though only to a point. If an individual is unable to cope with the stress (physical and mental) of the course, after remedial work and a period to demonstrate improvement, the individual will be subject to RTU (returned to unit) procedure. Airborne training is designed to test personal and team motivation to the point where actual operations present challenges that candidates will be able to overcome. The argument being that there is no point in suffering doubts at 0300 hours, in the silence of a tactical operation, after a helicopter or transport plane has dropped you off in or around enemy lines. A sense of humour is the key to P Company. Candidates are not expected to be superman; they just need the above to pass the course. Like most training courses in the UK military, P Company has a policy of ‘train in’ rather than ‘select out’. Members of No.2 Squadron are required to pass the arduous RAF Pre-Parachute Selection (RAFPPS) course in order to attend a military parachuting course at RAF Brize Norton. It must be noted that the RAFPPS course is not the same as the PPS courses delivered by the Parachute Regiment. The RAF course was originally intended to be a preparation and selection course prior to personnel attending P Company. However, apparently, the standard set was so high that the RAF dropped the requirement for attending P Company. I understand that RAF personnel (other than No.2 Squadron) can still attend P Company. P Company is the only recognised route for Regular and Reserve members of the UK military to become airborne soldiers. P Company is open to male and female officers and other ranks of the UK, except for No.2 Squadron RAF Regiment who undertake the RAF Pre-Parachute Selection course. Although the vast majority of spaces on P Company are allocated to personnel who will serve with airborne forces, some vacancies are allocated to individuals who will never directly serve with airborne forces. All officers and other ranks can apply for P Company after they have completed all Phase 2 (employment) training associated with their career employment group (CEG or Service equivalent). However, not all officers and other ranks will be eligible for subsequent service with airborne units, as jobs with these units are subject to career employment group (CEG) criteria and requirements of the Service. And, personnel who pass P Company do not transfer to the Parachute Regiment and P Company is not a conversion course (it provides candidates with an extra set of skills that the wider-Army does not possess). Passing P Company only qualifies men and women for the Army units that support 16 Air Assault Brigade. The All Arms Pre-Parachute Selection (AAPPS) course is different to the Combat Infantryman’s Course (Para) (CIC (Para)) that Regular Army Parachute Regiment recruits must pass. The CIC (Para) takes civilians and converts them into Parachute Regiment personnel. In contrast, the AAPPS takes fully trained personnel and provides them with the skills necessary to become Army/Navy/Air Force Paratroopers who are then eligible to work alongside Parachute Regiment personnel. The unit Commanding Officer (CO) and Medical Officer need to approve a candidate’s application. There is no compulsory requirement for P Company trained personnel to serve with airborne forces. However, it generally accepted that, for example, Royal Engineer candidates will serve at least one tour (usually 3 years and immediately after P Company) with the relevant airborne unit, in this case 9 (Parachute) Squadron Royal Engineers. All officers and other ranks over the age of 18 who have completed Phase 2 training are eligible to apply for P Company. For serving members of the Regular Army, Royal Navy, Royal Marines and RAF there is no upper age limit for applying for P Company, subject to the medical and fitness criteria. Theoretically, at least, personnel can apply in the last year of employment. In 2003, “at the age of 55”, Captain Norman Fox became the oldest person to successfully complete the Royal Marines Commando Course (Regimental Gazette, 2003, p.44). Norman had previously completed 30 years in the Parachute Regiment. Norman completed the Reserve version of the course, the Reserve Forces Commando Course. Candidates should have a minimum medical classification as per JSP 950 ‘Medical Policy’ (published 01 April 2011, formerly JSP 346). Candidates should also refer to the relevant DIN as published by the Sponsor Branch (The Parachute Regiment). The Royal Military Police (RMP). However, on occasion, there will also be small numbers of authorised foreign personnel. Verbal briefings are provided to training and regimental units which are designed to inform airborne aspirants about service with airborne forces. Furthermore, certain Army airborne units sponsor individual training courses designed to assist individuals with their personal preparation which consists of familiarisation, physical (strength and conditioning) development and mental development (Osborne, 2014). It is important that candidates attending P Company ensure they have ‘adequately’ prepared themselves, both mentally and physically. Although passing P Company is the goal of all candidates, how each candidate trains to achieve this goal will be different. Finally, candidates should ensure that they are competent in basic map reading, navigation and weapon handling. The Strength, Conditioning and Familiarisation package (also known as the Unit Preparation Course) is delivered as a 2.5-week course with the frequency of training expected during the PPS process. This period of training is designed to provide airborne aspirants with an insight into life and training with airborne forces and is conducted at unit level under the guidance of Royal Army Physical Training Instructors (RAPTCIs) and All Arms Physical Training Instructors (AA PTIs). 16 Air Assault Brigade’s core role is to provide the Air Assault Task Force (AATF) and as such is the British Army’s rapid reaction force. To perform this role the brigade must attract, recruit and select sufficient and quality personnel for service in the airborne forces. As such the brigade is the main ‘supplier’ for personnel attending the AAPPS course and sponsors the Physical and Mental Development package which is a 2.5-week course led by 16 Air Assault Brigade and delivered from the ITC Catterick. This 2.5-week course which is held immediately prior to the PPS course builds on fitness and stamina levels preparing candidates for sustained physical training. Circuit training, running, swimming and a series of loaded marches increasing in distance are performed to aid physical development and develop course and team spirit. Typically, personnel will have to successfully complete this course in order to be put forward for the All Arms Pre-Parachute Selection course. Day 1 (Tuesday) is ‘Screening Day’ consisting of an 8-mile Combat Fitness test followed by a 1.5 mile run in under 10 minutes (Sapper, 2014). Day 2 (Wednesday) is the first TAB, otherwise known as ‘Goodwood Races’, includes a few laps of ‘the Land of Nod’ (four steep hills conducted at a very fast pace) “…with a nice little runaway through the woods thrown in for good measure.” (Sapper, 2014, p.734), ending with a quick circuit session. Day 3 (Thursday) is the first run, an introduction to ‘Speedplay’, which is a fast six or seven miles consisting of a mixture of runaways and hill rep work/pain stations. In the afternoon there is Battle PT, an introduction to the assault course and some casualty carries. Day 4 (Friday) is active recovery consisting of swimming and stretch sessions. Day 5 (Monday) is the ‘Mini Nod’, about 10 laps of a figure of eight on a steep hill. Day 6 (Tuesday) is speed-play. Day 7 (Wednesday) is an 8-miler “with a little bit of combat fitness thrown in.” (Sapper, 2014, p734). Day 8 (Thursday) is Fartlek. Day 9 (Friday) is active recovery consisting of swimming and stretch sessions. Day 10 (Monday) is a 7-mile TAB. Day 11 (Tuesday) is a Personal Fitness Assessment (PFA) training/sprint session. Day 12 (Wednesday) is the 10-miler, the final test which is a pass or fail. It is sort of an introduction to the P Company 10-miler and a final Pre-Para test at the same time. 10-miles in 1 hours 50 minutes. 16 Air Assault Brigade (delivers centralised courses for all units within the brigade). 216 (Parachute) Signals Squadron (British Army, 2014). 201 Battery 100 Regiment (V) Royal Artillery (An Army Reserve unit): works in support of 7 Para RHA and conducts a ‘Pre’ Pre-Parachute Selection cadre for aspirant airborne reserve soldiers (The Gunner, 2013). 299 Parachute Squadron Royal Engineers (an Army Reserve unit): requires all airborne aspirants to pass its preparation course prior to attendance on the Army Reserve Pre-Parachute Selection course. This preparation course is delivered by Aden Troop and lasts for six weekends over a twelve week period. It is run by instructors from Aden Troop and is designed to improve a candidate’s physical fitness, stamina and robustness. 144 Parachute Medical Squadron (an Army Reserve unit). Due to the demand for vacancies by Regular Army parachute units it can be difficult for Regular Army (and more so Reserve forces) personnel not normally associated with airborne forces to be allocated a vacancy on a Pre-Parachute Selection course. However, that said it is difficult but not impossible. All candidates for Pre-Parachute Selection courses will receive a combined joining instructions and course preparation handbook which outlines, for example, the training programme that candidates will undertake. It provides advice on accommodation, car parking, dress, food, equipment to bring and not to bring, a generic fitness training programme and a number of other useful titbits of information. Dates of all PPS courses covered in this article are published annually in the relevant DIN. Alternatively course dates can be obtained from P Company direct or the relevant unit training wing. All P Company courses are attended by volunteers from across the UK military who aspire to join the airborne forces. The common standards, both in the training and selection of prospective airborne soldiers, form a key part of The Parachute Regiment and 16 Air Assault Brigade’s ethos and culture. All Arms Pre-Parachute Selection (typically four per year). Recruit Test Week (typically twelve per year). Army Reserve Pre-Parachute Selection (typically two per year). Army Reserve Combat Infantryman’s Course (Para) (typically two per year). Exercise Airborne Student (typically one per year). P Company also runs the PARA’s 10 Charity Challenge Race each year and with the above courses “equates to around 2000 miles of running and tabbing per man per year.” (Osborne, 2014, p.14). Basic Fitness Assessment: a 1.5-mile run, preceded by a 1.5 mile warm-up run, which must be completed in less than 9 minutes 30 seconds. To earn a P Company number (worn on clothing for the duration of the AAPPS) aspirants must pass Screening (Sapper, 2015). to test week (total distance covered is 94 miles). Loaded Marches: carrying a bergen weighing 35 pounds (plus water bottle) and a weapon, a number of theses marches include ‘hill repetitions’. Fast Runs: candidates take part in demanding runs up to a distance of 11 miles dressed in t-shirt, trousers and trainers. Candidates carry a water bottle in ‘stripped-down’ webbing and also conduct ‘hill repetitions’. Circuit Training: candidates attend a number of circuit training sessions in the gymnasium. These sessions concentrate on upper body strength as well as the legs. Map Reading: after some revision periods candidates sit a basic map reading test. First Aid: revision periods concentrate on basic first aid techniques. Field craft: Exercise Pegasus Dagger is a 24-hour exercise during which candidates administer themselves in the field under tactical conditions. Candidates also take part in blank firing attacks up to section level and a day/night navigation exercise. Bayonet Fighting: candidates carry out bayonet fighting techniques on the Infantry Training Centre’s bayonet ‘run’. Military Swim Test: a basic test which all serving soldiers must attempt. Day 1 (Tuesday) starts with a run called ‘Speed Play 1’ which consists of a five to six mile fast run but at every mile candidates will have a little thrashing (at work/pain stations!) until the last person is in then everyone carries on running again. The afternoon involves first aid lessons, kit checks and navigation theory. Day 2 (Wednesday) is ‘Goodwood Races’, a punishing and quick tab with lots of hill reps on Goodwood hill, a hard event but over quickly. The afternoon involves Battle PT (e.g. baby carries, piggy backs, fireman’s carry’s, leopard crawling and races in teams). Day 3 (Thursday) is ‘Speed Play 2’, very similar to Speed Play 1 but harder, longer and faster. The afternoon involves an upper body gym circuit session. Day 4 (Friday) is the ‘Four Horsemen’ followed by another gym-based session in the afternoon. Day 5 (Monday) is an 8-mile loaded march at an average pace; the catch being a 2-mile ‘run away’ just as aspirants approach the gate back into camp. The afternoon is an introduction to the assault course (with a taste of what is to come on the steeplechase). Day 6 (Tuesday) is a gruelling 20-mile navigation exercise, completed in teams of mixed ranks, carrying approximately 43 lb. There is a time limit of 8-hours. Once completed, aspirants have the rest of the day to themselves! Day 7 (Wednesday) is the infamous ‘Snakes Pass’, or as some aspirants call it ’11 miles of hell!’ The pace is steadier than the two Speed Plays but aspirants legs will be tired. This is followed by a Battle PT session in the afternoon. Day 8 (Thursday) is the ‘Land of Nod’, a cross country tab covering approximately 8-miles, including loops around the ‘Land of nod’ a set of four very steep hills at a fast pace. In the afternoon aspirants will have a boxing circuit involving upper body, planking and punch bags. Day 9 (Friday) is the ‘Para’s 10’, a very fast paced 10-mile tab to be completed in under 2 hours. Mans run’, wearing webbing with rifles on your back, an event designed as a shake out and to assess injuries heading into test week. During week 2 aspirants will conduct Exercise Pegasus Dagger which consists of (not necessarily in this order): Snake’s Pass which is an 11-mile run, then a navigation exercise in the afternoon which is approximately 20 miles, followed by the exercise phase which consists of a 5-mile stretcher race through the night wearing webbing and personal weapon. P Company Test Week is common to all three PPS courses and all Regular Parachute Regiment recruits and all regular and Reserve officers and other ranks undertake the same basic tests. Parachute Regiment recruits attempt Test Week at Week 21 of the CIC (Para) and All Arms candidates attempt Test Week after a two and a half week build-up phase. Reserve personnel from 4th Battalion (4 PARA) and other Reserve airborne units attend a condensed 4-day PPS course tailored to their requirements. During Test Week, candidates are expected to run, march and carry dead weights over 1-20 miles on undulating terrain (a total of 41 miles). Test Week comprises eight separate events over a four and a half day period. Seven events are scored with one, the Trainasium, being a straight pass or fail. Each event is designed to assess a candidate’s physical fitness, mental robustness and determination. A candidate who fails to display the appropriate level of self-discipline and motivation throughout Test Week will fail the course. Test Week starts on a Wednesday morning and finishes the following Tuesday, as highlighted in Figure 2. P Company delivers Test Week to Parachute Regiment recruits in Week 21 of the Combined Infantryman’s Course (Para) Syllabus. The Test Week undertaken by recruits is identical to the one undertaken in Phase 3 of the AAPPS. P Company delivers a condensed 4-day PPS course tailored to the requirements of the 4th Battalion, The Parachute Regiment (4 PARA) and other Reserve airborne units. It differs only slightly from the Regular Army’s Test Week – the main differences being one less event (endurance march), extra time allocated to the 10-miler (10 minutes), the steeplechase (1½ minutes) and the two-miler (1 minute). P Company delivers a 12-day CIC (Para) to recruits from 4 PARA. The CIC (Para) includes instruction on field craft, shooting, platoon-level tactics and a five-day exercise. The CIC (Para) is immediately followed by the Army Reserve PPS Test Week. This is a 9-day intensive course for officer cadets from the 19 University Officer Training Corps. Exercise Airborne Student includes tuition on field craft, section-level tactics, patrolling and a two-day confirmatory battle exercise. Exercise Airborne Student culminates with the Army Reserve PPS Test Week. Candidates who pass the course are awarded their maroon berets and are qualified to attempt the Basic Parachuting Course at RAF Brize Norton, and earn the distinctive Para wings. Personnel may then be eligible for service within 16 Air Assault Brigade and other airborne units. It should be noted that there is a significant backlog of personnel awaiting their basic parachuting course, and as such award of their wings (Section 7.3). Although the Parachute Course Administration Unit (PCAU) forms part of the Infantry Training Centre (Catterick), it is based at RAF Brize Norton in Oxfordshire. As part of CIC (Para). 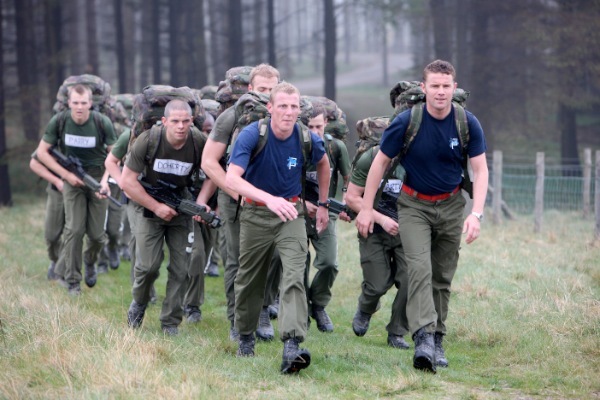 32-week Royal Marines Recruit Course. Regular forces UKSF Selection Course. UKSF (Reserve) forces UKSF Selection Course. Pathfinder Platoon (if not already parachute qualified). Specialist parachute courses are also conducted for both UKSF and Field Army/Royal Navy Fleet Units to train personnel in the skills of Static Line Square parachuting and Military Free Fall parachuting. The Reserve Forces course (lasting two weeks as students arrive at the school partially trained). Landing and emergency drills for all situations that may arise during a descent. Students could find themselves making their first descent by the fourth day of week one, and the importance of thorough ground training and rehearsals becomes apparent when the parachutist realises they will only be in the air for approximately 25 seconds or less! Did you know? It takes around three seconds for the parachute canopy to fully deploy and the low-level parachute descends at a rate of 21 feet per second. During weeks two and three students are taught all the additional skills required to become operational parachutists, including equipment packing and emplaning and drop zone drills. 600 ft exit, simultaneous stick, container, day (qualifier). Successful completion of the final, qualifying, jump leads to a ‘wings parade’ on the drop zone where the newly qualified paratroopers are presented with their parachute wings. The Royal Navy’s Subsunk (or Submarine) Parachute Assistance Group (SPAG), led by a Lieutenant Commander (OF-3), are a specialist airborne unit providing round-the-clock rescue cover for major incidents at sea involving submarines or surface ships of any nation (RN, 2014). SPAG was formed in 1967 when the Royal Navy identified that a specialist parachute-trained emergency rescue team could be needed to provide assistance to submarines in difficulty, particularly those submarines operating in remote areas (Farmer, 2014). SPAG is on constant standby to travel to stricken submarines; 6-hours notice to take-off, 24 hours a day, all year round with a Hercules aircraft stationed at RAF Brize Norton to ferry them to the scene. SPAG is a mixture of medics, engineers and submarine escape specialists taken from all the Services; although originally formed using members of staff serving at the Submarine Escape Training Tank (SETT). SPAG members are trained in water descent parachuting from 3000 ft with all of the equipment required to set up a floating casualty reception facility using both round and square static-line parachutes. All of the team are medically trained in addition to their more specific roles. An annual exercise is conducted which is aimed at maintaining the Operational Parachuting Standard of the SPAG by training new parachutists on the 22 ft Steerable Static Line (22’ SSL) parachute, retain currency for qualified 22’ SSL and Static Line Square (SLS) parachutists (Hynes, 2012). The exercise also supports other unit’s continuation training in support of SPAG, including 148 Commando Forward Observation Battery Royal Artillery and the Fleet Dive Unit. When on operations the team numbers ten personnel, drawn from a larger group of approximately thirty SPAG trained personnel. For outline of SPAG in Gibraltar in 2012: Global Gateway, p.14-15 (2012-09). DCI (RN) 378 – SPAG Badge (1977-06-24), implementing special skill badge. DCI (RN) 273 – Wear of Parachutist Badge (1991-11-29), removal of parachutist badge for RN officers and warrant officers. DCI (RN) 131 – Reinstatement of Parachutist Badge (2003-11-14). The Royal Navy’s BR3 Chapter 39 Annex 39E (June 2015) details the specialist badge to be worn by SPAG personnel, as illustrated in the picture (see right). BR3 states that badges for additional qualifications and special skills are not worn by Officers/Warrant Officers and are worn on the right cuff by other ratings. Further, specialist qualification badges awarded by other nations may not be worn on Naval Service uniforms. JSP 754 states that from 01 October 2013 personnel assigned to SETT who are nominated and qualified for SPAG duties will continue to receive Recruitment and Retention Pay (Parachute) on a non-continuous basis while in approved qualifying roles. Some people incorrectly state DCI RN 131 as the authority for SPAG personnel to wear the classic parachute wings associated with the Parachute Regiment. DCI RN 131 merely re-authorised the wearing of the classic wings for those who had completed a Basic Parachute Course, as SPAG personnel attend a Special Parachute Course they are not entitled to wear the classic wings (I am waiting on an FOI request to get a definitive answer to this, reply below). After an FOI request to Navy Command, it would seem that the above paragraph may not be strictly accurate. The FOI response also contradicts the BR3s version of SPAGs full title: SubSunk version Submarine (semantics really but to be noted). 16 Air Assault Brigade was formed on 01 September 1999 from two pre-existing formations, 5 Airborne Brigade and 24 Airmobile Brigade. Based in Colchester, Essex, the brigade HQ is formed from both Army and RAF personnel enabling it to integrate Air and Land operations. 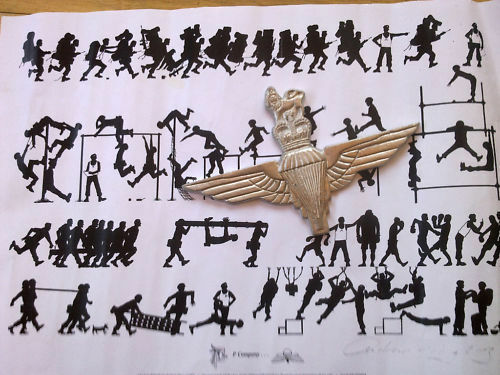 16 Air Assault Brigade’s ‘Striking Eagle’ badge was adapted from the Special Training Centre in Lochailot Scotland where Special Forces and Air Troops were trained during the Second World War. The colour of the badge is to symbolise the joining of the Paratroopers (Maroon) and the Army Air corps (Light Blue). The brigade is the British Army’s largest brigade with approximately 8,000 soldiers, combining the speed and agility of airborne and air assault troops with the potency of Apache attack helicopters. The brigade’s core role is to provide the Airborne Task Force (ABTF), the British Army’s rapid reaction force, which is ready to deploy anywhere in the world at short notice to conduct the full spectrum of military operations, from non-combatant evacuation operations to warfighting. The role of the Commander 16 Air Assault Brigade, a Brigadier (OF-7), is to command OPCOM troops and prepare and deliver force elements in role in order to contribute to the Land Command and UK Defence capability. As directed, deliver the required collective training for all Force Elements assigned to the brigade and increase and enhance the deployability of soldiers within the brigade. As part of Army 2020, the brigade will be subject to a number of reductions and reassignments which will see its strength dropped from around 8,000 to nearly 5,000 personnel (Ripley, 2014). The Infantry Training Centre (ITC), located in Catterick and commanded by a Colonel (OF-5), trains all the British Army’s infantrymen, producing some of the best infantry soldiers in the world. Recruits joining any of the Infantry Regiments – including The Footguards, The Parachute Regiment and The Brigade of Gurkhas – complete the appropriate Combat Infantryman’s Course (CIC) at ITC Catterick, which represents their combined Phase 1 and 2 training. Junior Entry infantry soldiers (aged 16-17) receive Phase 1 training at the Army Foundation College Harrogate, then move on to ITC Catterick to complete their 12-week Phase 2 training programme before joining their battalions. For more information about an infantrymen’s initial combined Phase 1 and 2 training and the Combat Infantryman’s Course view: British Army Phase 1 Initial Training, Part Five. Pegasus Company is located at the Infantry Training Centre in Catterick, North Yorkshire and is staffed by serving members of The Parachute Regiment and 16 Air Assault Brigade providing courses for both Regular and Reserve personnel. Although the Parachute Course Administration Unit (PCAU) forms part of the ITC(C), it is based at RAF Brize Norton in Oxfordshire. PCAU has a long-established relationship with the RAF’s No.1 Parachute Training School, providing support for students of all ranks, and also RAF Instructors to enable courses to be conducted smoothly; this allows both students and instructors to concentrate fully on the main objective of producing trained military parachutists for operations. PCAU also provides manpower and resources for the airborne equipment demonstrations conducted for a wide range of VIPs who visit the school. The demonstrations seek to introduce visitors to the world of military parachuting. Most visitors rapidly gain an insight into the demand for high standards of fitness required by paratroopers when invited to don complete ‘Jumping Order’ with parachutes, heavy-weapons load and full-issue kit. PCAU also maintains the tri-service database for all service parachutists. This database is consulted by a variety of establishments seeking information for reasons ranging from pay entitlement to historical interest by veterans’ groups. The data is also regularly consulted by Service Police in cases of suspected fraud and/or non-entitlement to wear parachutist’s wings. With electronic records dating back to 1967 and a card index back to the 1940s, no-one slips through the net. The Static Line Square Course (an 8-jump course for specially selected Service personnel): using the static line square parachute, troops are despatched from a C-130 or Skyvan aircraft at heights ranging from 1200ft to 3000ft and due to the parachutes flying characteristics are able to land within yards of one another. Continuation Training Flight: is an integral liaison and facilitator of parachute training for 16 Air Assault Brigade, organising and operating ab-initio training and continuation/refresher training through various exercises both within the UK and abroad. Whilst the major part of the Continuation Training Flight is based within the PTS, at RAF Brize Norton, the ADW has several Parachute Jumping Instructors (PJIs) embedded within 16 Air Assault Brigade. This facilitates a better relationship between the Front Line Commands allowing greater communication between the Services whilst on training exercises and operational detachments throughout the UK and overseas. Instructor Training Flight: is populated by experienced and highly qualified PJIs who deliver ab-initio and refresher parachute and Drop Zone Safety Officers training to personnel on the PJI course and those returning to parachuting duties following an extended absence from the ADW. P Company is open to all officers and other ranks of the UK military. Airborne units seek to attract determined, highly-motivated, intelligent, reliable and physically fit individuals to serve with airborne forces. This article provides the basic information to allow individuals to make an informed judgement before applying for P Company. The regulations for Recruitment and Retention Pay (Parachute) (RRP (Para)), previously known as additional pay or Specialist Pay (Parachute), are laid down in JSP 754 Tri-Service Regulations for Pay and Charges Chapter 6 Section 10. Basic Parachute Course qualified personnel filling appropriately annotated posts will be paid at the basic rate of RRP (Para). Other than The Parachute Regiment, Army dress committee policy only used to allow those units that were part of 16 Air Assault Brigade to wear the maroon beret. Army 2020 created a number of sub-units whose only reason for being is to support 16 Air Assault Brigade but whose peacetime chain of command is outside the formation for reasons of maintaining specialist capabilities. HQ 16 Air Assault Brigade submitted a case asking for such sub-units to be allowed to wear the maroon beret and this was endorsed at the Army dress committee in November 2013 (Lowe, 2013). In January 2013 a submission to Soldier (magazine of the British Army) by one Private Corfield (2013) of the MPGS (Military Provost Guard Service) caused a ‘little’ stir. Corfield argued that the Parachute Regiment, and de facto other airborne units, had become outdated and should be scrapped to save money rather than other regiments that had a longer military history. Two officers (Earl, 2013; Rands, 2013), a RAF Flight Lieutenant and Army Major respectively, expressed disappointment with the replies of certain individuals in the February 2013 edition of Soldier. The officers, both proponents of airborne forces, suggested that instead of berating Corfield for expressing his opinion the said individuals should ‘back their corner’ with a reasoned argument. However, in the same month Dan Jarvis (a former Parachute Regiment officer and now Labour MP) stated in the Daily Mail that parachute training was gradually being phased out and now only 80 personnel will conduct jumps on exercise, were previously it had been 800 (Nicol, 2013). The Daily Mail (Nicol, 2013) also stated that an MOD spokesperson had admitted that the Army had reduced the size of the parachute force on short notice to 80 personnel and added that parachute training had never formed part of basic training for Parachute Regiment recruits. This move also coincides with the phased withdrawal of the RAFs main transport aircraft, the Hercules, used by Para’s for their jumps. Ultimately, in my opinion, the discussion should be about what pre-parachute and parachute training delivers by way of a soldier’s ethos and contribution to military effectiveness. I suppose it could boil down to: is pre-parachute training just another form of training or something more? I never attempted P Company; jumping out of a plane was not my cup of tea. In July 2014, 15 members of the Permanent Staff of P Company attempted and completed all the tests of P Company’s Test Week in a 24-hour challenge (Soldier, 2014). 12 Parachute Headquarters and Support Squadron (disbanded in 2013 and revived in July 2018, is responsible for the Regiment’s resourcing, administration and training, as well as its specialist diving, design and reconnaissance capabilities) (British Army, 2018). 299 Para Squadron Royal Engineers (is the only parachute trained engineer unit in the Army Reserve and provides close combat engineering support). 144 Parachute Medical Squadron: is the only Army Reserve medical unit with a parachute capability (has detachments in London, Glasgow, Cardiff and Nottingham). 216 (Parachute) Signals Squadron: operating cutting-edge communications and information systems (CIS) at the tactical, operational and strategic levels in support of the brigade. 201 Battery 100 Regiment (V) Royal Artillery (works in support of 7 Para RHA). 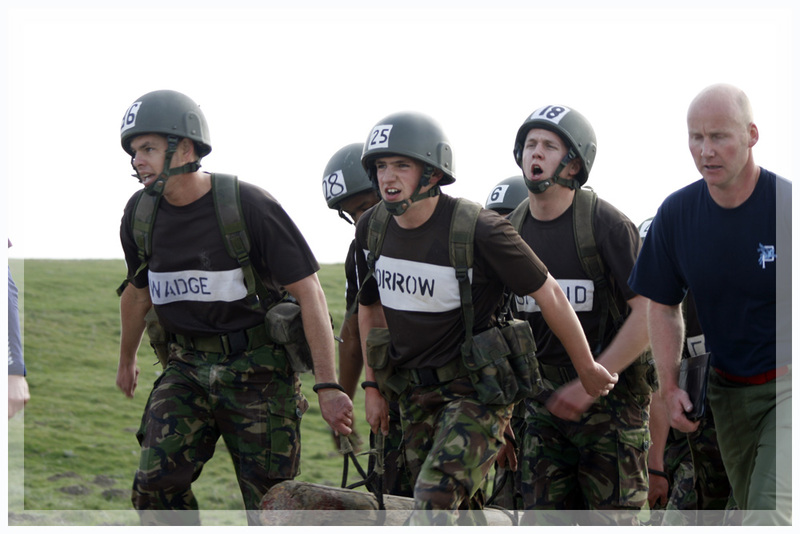 The Paras was a BBC1 TV documentary series about the British Army’s Parachute Regiment training regimen. The documentary focused on the recruits of 480 (Training) Platoon undertaking their basic training between January and June 1982 and was first aired during November and December 1983. It was repeated in 1984 with an update on the platoon members’ lives in the last episode. Filming for the documentary began just prior to the onset of hostilities with the Argentines in the Falklands War, which is discussed by both the training staff and recruits. The documentary was written and presented by Glyn Worsnip in a fly-on-the-wall style, giving the viewing public a unique insight to military life, and was accompanied by a book of the same name written by the principal researcher Frank Hilton (1983). Some of the recruits who starred in the documentary went on to have long and distinguished careers including Dean Ward and Rod Stoner. Also, one of the platoon’s training staff, Corporal Al Slater, was later killed in Northern Ireland whilst a member of the SAS. In 2011 the BBC aired the five episode documentary series ‘Regimental Stories’ which featured the Parachute Regiment in episode two. Narrated by Sean Pertwee (with privileged access, frank interviews and early archive footage) this documentary tells the story of how the Para’s history continues to motivate new recruits to their ranks as they fight for the right to wear the regimental maroon beret. Defence Instructions and Notices (DINs, most recent). JSP 754 – Tri-Service Regulations for Pay and Charges (latest edition). ATP-57(B) The Submarine Search and Rescue Manual (latest edition March 2009) for further information on SPAG. AFPRB (Armed Forces’ Pay Review Body) (2013) Armed Forces’ Pay Review Body: Forty-Second Report 2013. Norwich: The Stationery Office. ARRSE (2005) Women to Attempt P-Coy. Available from World Wide Web: http://www.arrse.co.uk/community/threads/women-to-attempt-p-coy.13179/. [Accessed: 02 September, 2014]. BBC News (2005a) Woman Aims to Make Para History. Available from World Wide Web: http://newswww.bbc.net.uk/1/hi/uk/4455213.stm. [Accessed: 02 September, 2014]. BBC News (2005b) Broken Leg Ends Woman’s Para Bid. Available from World Wide Web: http://news.bbc.co.uk/1/hi/uk/4475439.stm. [Accessed: 02 September, 2014]. Boyden, B. (2014) ‘Women Deserve to Earn Wings’. Soldier: Magazine of the British Army. March 2014, pp.63. British Army (2014) 16 Air Assault Brigade HQ & Sig Sqn (216). Available from World Wide Web: http://www.army.mod.uk/signals/25289.aspx. [Accessed: 08 September, 2014]. British Army (2018) Airborne engineer squadron returns to the ranks. Available from World Wide Web: https://www.army.mod.uk/news-and-events/news/2018/07/airborne-engineer-squadron-returns-to-the-ranks/. [Accessed: 29 August, 2018]. Brownridge, M. (2013) Para Proposal Perplexes Personnel. Soldier: Magazine of the British Army. February 2013, pp.57. Chandler, N. (2014) Women get the OK to try out for the elite Parachute Regiment. Available from World Wide Web: http://www.dailystar.co.uk/news/latest-news/368841/Women-get-the-OK-to-try-out-for-the-elite-Parachute-Regiment. [Accessed: 02 September, 2014]. Clapson, J. (2013) African Assault. Soldier: Magazine of the British Army. December 2013, pp.33-35. Corfield, A. (2014) ‘Drop the Parachute Regiment’. Soldier: Magazine of the British Army. January 2013, pp.51. Earl, D. (2013) Wings Wrangle Ruffles More Feathers. Soldier: Magazine of the British Army. March 2013, pp.61. Farmer, B. (2014) Elite Navy Rescue Team Always On Call To Help Submariners. Available from World Wide Web: http://www.telegraph.co.uk/news/uknews/defence/10648941/Elite-Navy-rescue-team-always-on-call-to-help-submariners.html. [Accessed: 08 September, 2014]. Hilton, F. (1983) The Paras. London: BBC Books. Hynes, N. (2012) Training for the Unthinkable… Global Gateway: Magazine of RAF Brize Norton. September 2012, pp.14-15. Jackson, A. (2014) ‘Women Deserve to Earn Wings’. Soldier: Magazine of the British Army. March 2014, pp.63. Lindsell, J. (2013) Para Proposal Perplexes Personnel. Soldier: Magazine of the British Army. February 2013, pp.57. Lowe, D. (2013) Time to Remove the Maroon Beret? Soldier: Magazine of the British Army. December 2013, pp.54. Nicol, P. (2013) Army Chief’s Fury as Paras Lose Their Parachutes: New Cutbacks Mean Recruits Will No Longer Be Trained to Jump. Available from World Wide Web: http://www.dailymail.co.uk/news/article-2290896/Army-chiefs-fury-Paras-lose-parachutes-New-cutbacks-mean-recruits-longer-trained-jump.html. [Accessed: 08 September, 2014]. Osborne, G. (2014) P Company ITC Catterick. Mind, Body and Spirit: The Annual Journal of the Royal Army Physical Training Corps. Number 97, 2013/14, pp.13-14. Pamment, A. (2013) Wings Wrangle Ruffles More Feathers. Soldier: Magazine of the British Army. March 2013, pp.61. ParaData (2014) The Parachute Regiment Charter. Available from World Wide Web: http://www.paradata.org.uk/article/28725/related/28726. [Accessed: 02 September, 2014]. Pinnington, A. (2012) Completing P Coy. The Wire: Journal of the Royal Corps of Signals. February 2012, pp.75. Rands, J. (2013) Wings Wrangle Ruffles More Feathers. Soldier: Magazine of the British Army. March 2013, pp.61. Regimental Gazette: London Scottish (2003) Canteen Chat. Regimental Gazette: London Scottish. No 1054, Volume CVIII, Summer 2003, pp.44. Ripley, T. (2014) UK Air Assault Brigade Draws Down. Available from World Wide Web: http://www.janes.com/article/38327/uk-air-assault-brigade-draws-down. [Accessed: 08 September, 2014]. RN (Royal Navy) (2014) Royal Navy Submarine Service: Your Career Guide. Available from World Wide Web: http://www.royalnavy.mod.uk/Careers/Role-finder/Roles/~/media/Files/CNR-PDFs/Sub-Service_spreads.pdf. [Accessed: 08 September, 2014]. Soldier (2014) P Company Revenge. Soldier: Magazine of the British Army. July 2014, pp.13. The Gunner (2013) Ubique. The Gunner: The Regimental Magazine of the Royal Regiment of Artillery. February 2013, pp.18. On Boxing Day 2010, SFSG performed a company sized drop in Afghanistan, creating a blocking force for a heliborne attack. The first Parachute Regiment drop since Suez in 1956.